Locals were buzzing with excitement after spotting what appeared to be a heavenly vision in the sky. A bizarre cloud formation that may look to some like the Second Coming of Christ has captivated onlookers in Costa Rica. 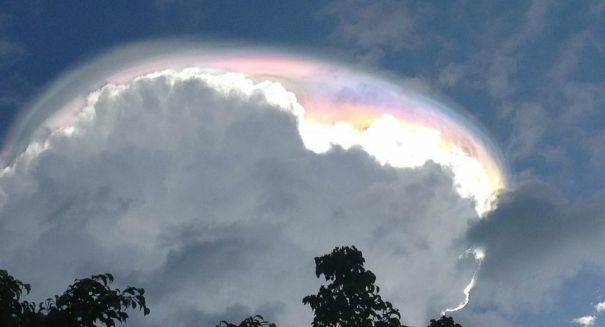 Scientists say they have an explanation for the incredible vision: a bizarre, multi-colored cloud over Costa Rica, causing many of the residents to wonder what it could be, according to a Christian Science Monitor report. The cloud appeared miraculously, dazzling onlookers with its rainbow-like appearance over Escazu in the province of San Jose in Costa Rica in the northwestern part of the country, which lies in Central America bordered by Panama and Nicaragua. It was first reported on Tuesday in a number of cities in the area, including San Jose, Escazu, Hatillo, Pavas, and Parrita, and it happened on the country’s Independence Day — perhaps a good omen for everyone instead of the End of Days? It caused people to flock to social media to post photos and video of what they saw. So what is it? The Second Coming of Christ? The Apocalypse? A throng of angels? God himself? UFOs? None of the above. It’s actually a phenomenon known as an iridescent cloud. And in fact, they’re not even that rare — just perhaps not this spectacular usually. More specifically, it’s known as a pileus cloud, or a “cap” cloud as it sits on top of a cumulus cloud. If anything, they herald something potentially destructive: the early stages of the development of a thunderstorm, as a strong updraft of rising air lifts into cumulus clouds, causing a layer of air above the storm to rise that is packed with moisture, which condenses into cloud droplets and results in the flat cloud you see capping the storm. That explains the rainbow-like color. Since the cloud is far enough away and this “cap” is loaded with water droplets, it provides the perfect view for people to see sunlight bent through the prisms of these droplets to create the colors you see. It’s not seen very often because they happen only in the early stages of thunderstorm development and it doesn’t last very long. The sun must be positioned behind these storm clouds as they build so the refracted light can reach your eyes. So a rather ho-hum scientific explanation can tell us what this is — still, it didn’t stop masses of people in Costa Rica from leaving their houses or offices to gawk at the incredible sight, with videos popping up all over YouTube and social media sites like Facebook and Twitter and Instagram. People stood in the streets oblivious to each other, gaping at the site. A similar phenomenon happened in the United States. In 2007, an iridescent cloud showed up over Boulder, Colo., prompting similar wonderment among the locals as NASA jumped in to explain it. The reason there is so much light refraction in this type of cloud and not regular clouds is that these clouds are much thinner and have lots of moisture, providing the perfect prism for the sun to pass through. Cumulus clouds are the cotton-like fluffy clouds you see prominently in the sky that are typically associated with storm clouds — which they are not — and are one of many types of these clouds. They have flat bases and fluffy tops, and are a more low-level clouds, usually no more than 3,300 feet int he air, except for vertical cumulus congestus forms. Cumulus clouds are often the precursors to cumulonimbus clouds, which can arise from instability and moisture. Cumulus clouds don’t produce much precipitation, but they can grow into cumulonimbus clouds. These clouds are formed from water vapor — essentially supercooled water droplets or ice crystals — and they can take many subforms. They are vital to the global temperature as they deflect much of the sunlight back into space. A pileus cloud — pileus is Latin for cap — is also called a cap cloud or a scarf cloud. It is a small, horizontal cloud that often appears above either cumulus or cumulonimbus cloud, often looking like a hood on top of the cloud. They tend to change shape very quickly and are formed by a strong updraft from lower altitudes, interacting with the moist air above and resulting in the warm air cooling to a dew point and resulting in the cloudy texture. This is why they make great indicators of incoming severe weather, providing a signal of instability and a vast movement of warm air in the atmosphere and therefore oncoming rainstorms or thunder and lightening, often accompanied by strong and potentially destructive winds. And it’s not just cumulus or cumulonimbus clouds that have pileus clouds above them. They can also form above the ash clouds from erupting volcanoes, with several images of just such a phenomenon occurring. They may even show up in the mushrooms clouds of particularly high-yield nuclear bomb detonations.